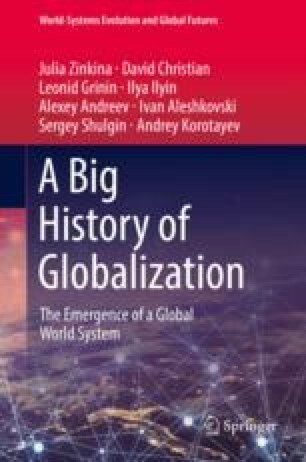 The early modern period witnessed the emergence of a number of processes and institutions that were to acquire global scale and have a significant impact on the structure of globalization. In this chapter, we will focus on three processes. The first is related to the invention of the printing press, which triggered the Second Information Revolution in the history of humankind. This dramatically reduced the cost of books, contributing to the democratization of literacy, and also facilitated the mass printing of periodicals, which involved increasing numbers of people into information networks. The second process is the so-called “Military Revolution”—a radical change in military organization, provision, strategy, tactics, and weaponry that resulted in political and administrative changes in many areas of the World System, and led to its major restructuring. The third process is the formation of modern statehood, which prompted the appearance of “global thalassocracies” and a number of modern institutions, whose concepts gradually became integrated worldwide.